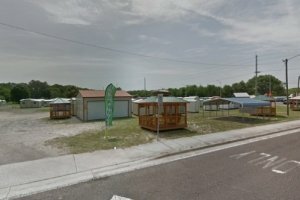 Why by a Handi-House Shed from Tampa Sheds? 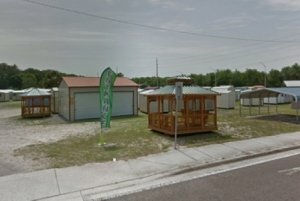 Why buy a Handi-House Shed ? 1. You have the option of an aluminum door with the same color and profile of your shed or the option of an Insulated Mobile Home Door (deadbolt compatible). Garage roll up type doors are also available for an additional charge. 2. T-Wall metal strapping along with notched studs with 1x4's to be attached to each member to assure maximum strength and durability in all wood frame buildings. Or get one of the toughest buildings in the industry with all steel studs! 3. 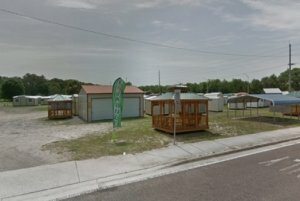 Our buildings are rated with the proper floor loads for each region in the state of Florida. We have buildings standard with 2x6 floor joist on 16" centers with 2 skids or 3 skids on 24" centers. For the economical minded customer, we also have 2x4's on 24" centers with our smaller units which still meet the live floor loads. 4. We use only "hot-dipped" galvanized nails in our floor system. The "hot-dipped" nail is assured to have the right amount of zinc that prevents any deterioration when used with the MCQ treatment that is used throughout the floor framing. All the screws used to attach the exterior siding are "crypton" coated with a minimum of 1000 hours of salt treatment. 5. All floor sheeting is tongue and groove treated plywood. 3/4" thickness comes standard on all sizes and meets all Florida State Codes. 6. Yellow pine studs are used for strength and durability. We also have the "SPF" studs noted for aesthetic looks and straightness. 7. Our sheds are offered with a top 2x4 header plate that goes all the way around the building or we add an extra stud in each corner to ensure each wall is self-supported. 8. Although different profiles of metal can be used on our roof system, our standard metal is "rainlock" that gives the extra depth in the profile to assure water elimination as quickly as possible. Handi-House also has a ridge cap that runs the length of the building for aesthetic looks and ventilation. In addition to washer headed screws that attach the metal to the roof, a clear sealer is applied to each screw to help assure your storage stays dry. 9. Handi-House warranties what their suppliers warranty to them. 30 years on aluminum siding, 15 years against hail damage, 20 years on the floor from termites, rot and decay, and 3 years on accessories (doors and windows). 10. Handi-House has been manufacturing portable sheds since 1966. To our knowledge, the oldest plant in the Southeast. 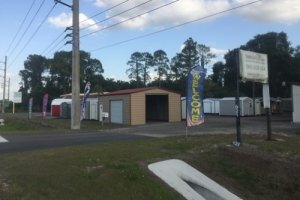 Tampa Sheds dealers are the oldest in the Tampa area. One of our locations has been serving the greater Tampa Bay area since 1976. They are all family owned and operated. With three generations of service and experience, what better reason to put your trust in one of our sheds!